Nick Holloway’s nursing career was spent working in care homes in South Wales. His many experiences, sad, shocking, harrowing, uplifting, depressing and amusing, inspired him to write Autumn’s Colours, his first novel. This light-hearted story is set in an imaginary care home in the Dorset town of Dorchester, the town in which Nick trained as a nurse. The people and events in the book are based closely on real care homes, real people and real towns. They squabble, chat, fall out, banter, make friends and attempt to seduce each other – just like people in the outside world. 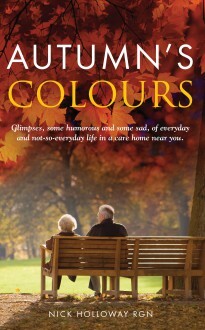 The events described in Autumn’s Colours will be familiar to anyone who works in a care home, or who visits somebody in one.